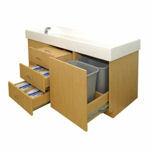 Cubby Changing Table with Sink. 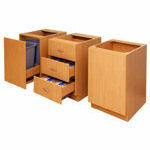 Commercial Diaper Changing Tables, Vanities and Hutches for Day Care Centers and Pre-Schools. The Hatteras Collection. Guidelines for Out-of-Home Child Care Programs. North Carolina hosts the National Training Institute for Child Care Health Consultants. The N.C. Division of Public Health has the most extensive curriculum to prepare child care health consultants in the country. State of the art design, quality construction and uncompromising attention to health and sanitation has set The Hatteras Collection apart from all others in the industry. The Hatteras Collection is a line of products for the child care industry targeting the professional who understands value, will not settle for anything but the very best, and has an unrelenting concern about the health and safety of children. The Hatteras Collection is comprised of distinctive and inimitable products including diaper changing tables, a formula/food preparation hutch, and toddler and preschool vanities. Designed to separate diapering, food preparation and general hand washing, The Hatteras Collection has been documented to reduce the incidence of infectious disease in out-of-home child care. Call us today!